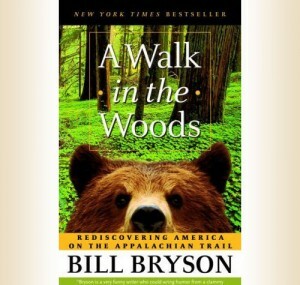 A Walk in the Woods, by Bill Bryson, was over before I even realized it started. The book itself is about a guy who returns to the U.S. after living abroad for several years; in fact, he wrote several books about his various journeys throughout Europe. Upon coming home, he decides that he wants to hike the incredibly long (and by incredibly, I mean over 2,100 miles long) Appalachian Trail from Georgia to its ultimate destination in Maine. Reading a 300 page book on a guy’s trek through trees and over mountains may not seem to be all that entertaining at first glance, but Bryson does a great job of making it so. That quote is about as seedy as this book gets, so if you’re looking for drunken shenanigans, this book isn’t for you. However, it’s still an amusing book that manages to pack a walloping message about the lack of care given to the Appalachian Trail and the surrounding wilderness. Every chapter starts out with at least a few paragraphs on the history of the AT, the current status of it, or various other ecological issues (acid rain is, from what I can gather, the author’s pet peeve). The author’s easy-going style of writing, however, makes it more interesting than preachy and the balance between historical facts and story make it an easy read. The other aspect of the book that I really liked is the author’s self-deprecating tone that he uses throughout the book. He’s not like the kid from Into the Wild who decides to burn his car, give away his money, and hike out into the wilderness. He’s a pretty normal guy whose love for cheeseburgers and CocaCola is surpassed only by his love for his family. He doesn’t take up the trail as a crusade against modernization or anything like that. He spends a good deal of time while on the trail looking forward to the next motel that skirts the AT, so he can get a hot meal and a cold soda. He doesn’t hold himself up as a saint, so he comes across as a humble, self-effacing guy who is somewhat out of his element. There are some books whose words seem to fly off the page faster than you actually read them. Maybe the offending book has been recommended by a friend. Maybe you picked it up at Borders after reading the back cover and it’s been sitting patiently on your shelf – content to wait, but always ready to perk up and entertain you. This is one of those books. If, for some reason, you do decide to read a book about a guy going hiking, this one should be it – and it will be over before you know it.